It’s already August and it looks like another school year’s about to begin. Although this could mean exciting things for your child, parents are often caught spending more than they should – as if they were Christmas shopping. 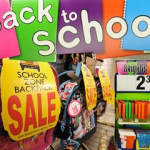 So if you’re a little tight on budget, save on the school shopping with these 10 hot tips. 1. Plan ahead, shop early – This advice always works, even for Christmas shopping. The advantage of planning ahead is that you can nab good items at earlier discounts such as Summer-end sales. Since kids usually wear short sleeved polo shirts most of the year, capitalize on that idea and get the basic pieces at good prices. 2. Scout the Old Stuff – Yes, there are certainly supplies that you can reuse. If that backpack still works, then just savvy it up with some button pins or bag charms. There’s really no need to get a new one just for the sake of the beginning of the school year. 3. Stick to the List – Just like grocery shopping, make a list of the things your child really needs. Once you have that all in the list, resist the urge to stray from it. A good idea would be to plan out the list with your child, to prevent whining and pouting when he decides that he wants that pricier lunchbox just because it looks better. 4. Don’t go cheap – Although cheap things may seem tempting, it’s best to stay away from them if the item is meant to last the whole year. This rule goes for clothes, bags, and especially shoes. 5. Resist the Urge to Buy Bulk – This advice is targeted to parents who choose to buy pencils, pens and other supplies by the bulk. When your child sees the mountain of supplies easily available to him, he’s more likely to lose his pens and crayons because he knows it can easily be replaced. This means buying more in the long run. 6. Go online – Good deals can usually be found online, and online trading doesn’t mean just buying stuff. If your child has some old but usable things, try and sell them online. You just might find a buyer. 7. Shop in Garage Sales – Neighborhood sales is a good place to find things that are still in good condition. Just make sure your child isn’t getting his classmate’s last year’s backpack. That could lead to some childhood frustration and humiliation. 8. Get organizers – Although buying a pouch or pencil case may seem like an extra expense, this could actually be quite useful. Getting your kid an organizer for his stuff can prevent him from losing things, and it can also prevent you from buying the replacements. Try to get your kids what they want (and need of course! ), but make sure not to give in to whining and extra requests. 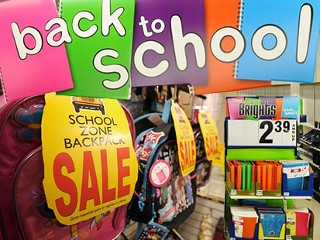 Be reasonable and firm in your shopping, but don’t be too thrifty to cause your child to be embarrassed in school. School shopping is just like buying new clothes, it takes time and patience.